While closed-end funds, in the form of investment trusts, were the grandfather of professional investment management, their Johnny-come-lately offspring – the open ended fund – has grown to dominate the diversified investment product market. Now worth some six times the value of investment trusts, unit trusts – as open ended vehicles are commonly known – looked to consign investment trusts to history. Yet last year was a bumper one for new investment trust launches and both costs and performance appear to favour the closed-end market. But investment trusts have largely been ignored by an adviser market locked into remuneration patterns difficult to replicate through the investment trust structure, while access to their shares has also proved a stumbling block. All this seems set to change, though, with RDR demanding a wider understanding of the investment opportunities available to clients and platforms increasingly willing to facilitate dealing in the shares of investment trusts. 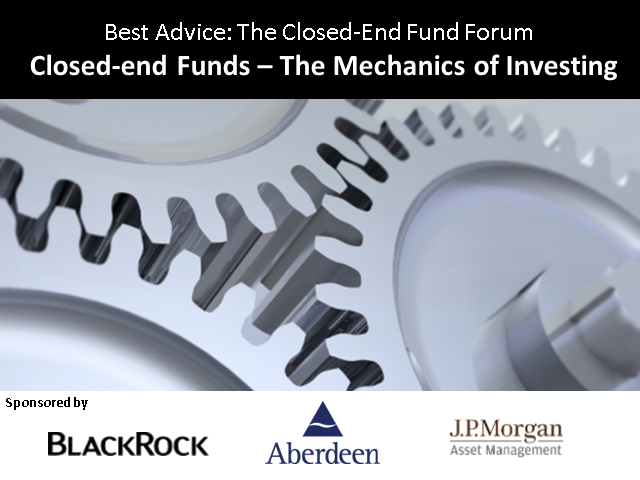 We will be looking at how you can use closed-end funds to the benefit of your clients and endeavour to demystify the issues surrounding access to this long established and potentially rewarding investment vehicle so that they may be properly considered alongside more traditional options.